Sometimes us humans have a habit of creating our own prison. We structure a day of routine, work, stress and – all the while – berating ourselves for anything we do wrong like some grumpy authoritarian prison guard. Take a step back from your daily life. You can make a conscious decision to do something for yourself, without any guilt, and enjoy it. What’s more, it doesn’t have to cost a penny. Need some ideas? I’ve got you. 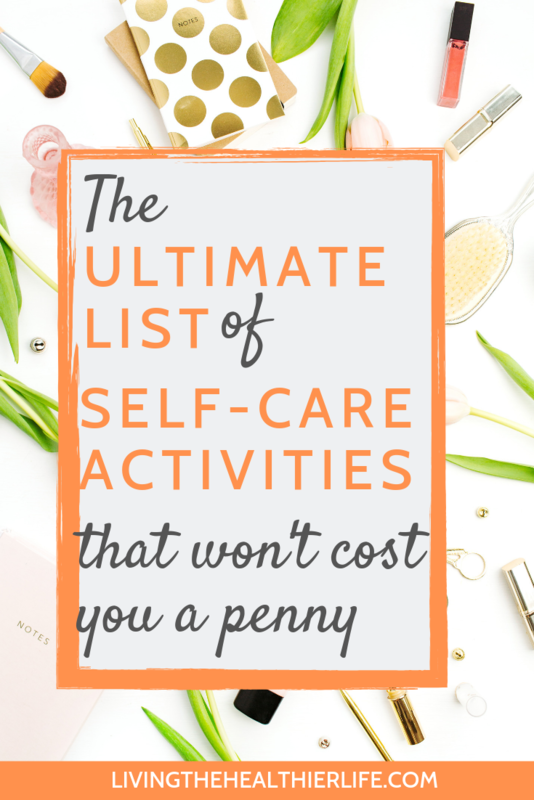 Here, I present the ultimate list of freebie self-care activities. Pick one today. Have a soak in the bath with some salts. Good quality salts can help you to relax, wind down and detox your body. A great way to get some little me-time. Light a scented candle. Aromatherapy is a tried-and-tested way to help improve you mentally, relax you and give you a better feeling of wellbeing. Take a nap. A short nap can help you recharge and wake feeling refreshed. Definitely one to try, even if you aren’t normally a nap person. Say no. Often our pressures come from outside of ourselves. And guess what? You can say no. Try it today – without the guilt. Ask for help. It’s also ok to admit you need help, and you’d be amazed at how happy people are to be asked. That list of tasks you’ve got for today? Ask a friend or family member to take one off your hands. Take a brisk walk. There’s nothing like a bit of fresh air and getting your heart rate up to help release those endorphins. Do a HIIT session at home. HIIT is great for the body, great for weight loss, and it will leave you feeling positive and energised. Do a yoga session at home. Yoga is well known for it’s stress-relieving benefits. It can calm the nervous system and leave you feeling more at ease and relaxed. Write in a journal. Sometimes just moving our thoughts from our heads to a piece of paper can help deal with negative emotions, and help you improve your mood. Read a novel. Escape from the real world with a good story but getting engrossed in your favorite novel. Listen to music. Music has amazing therapeutic qualities, so put on your favorite album, close your eyes and listen without distraction. Bake. Measuring, stirring, kneading – all great ways to distract yourself from the day and focus on an enjoyable activity (with a rather great reward at the end of it, too). Sing a song. Singing is great therapy, and fun. Stick on your favorite track and sing at the top of your voice (as long as your neighbors are forgiving!). Dance. It will release endorphins, make you feel great, and it’s a lot of fun. Even if you have two left feet. Play an instrument. Putting your mind’s focus on an activity that requires a 100% concentrate, like playing or learning an instrument, allows you to quieten down the negative thoughts, emotions and stress that make up so much of our every day life. Learn a new language. If music isn’t appealing, why not learn a new language? Not only is it a great way to focus your mind, it will also come in handy. Take your kids to the park. If you have kids, get some fresh air and take them for a walk around the local park for a run around – it’s a great escape from everyday stresses and work worries. Spring clean. That cupboard you hate going in? Empty it out and start again. It’ll leave your head feeling clearer too – try it! Watch your favourite comedy. Laughter is the best medicine, so they say. And what better way than a 2 hour movie session with your favourite comedy. Grab the popcorn. Change your bed sheets. Is there anything more purely blissful than getting into fresh, clean bed sheets after a long tiring day? Sew. Doing an activity with your hands that requires focus and concentration is a great way to help take your mind off things. Paint. OK, so you haven’t painted since you were a child. And you’re no Van Gogh. But don’t let that stop you from trying it – it’s a fun and relaxing pastime. Sketch. If you’re art is more about detail, why not try your hand at sketching? You might be surprised at just how much you enjoy it – even if it’s little more than a doodle. Turn off your phone and internet for the day. Detoxing from the online world is without doubt one of the best self care practices you can do so try this one as often as you can. Call a friend. One of the things about running your own business is that you don’t get that buzz of being in a big office, chatting to your colleagues. So make time to call up a friend occasionally. Write a letter. Write a letter to the person you love, whether that’s your family, kids or other half. It doesn’t have to be Shakespeare. But it’s something they will treasure forever. Do some gardening. Digging up the soil, getting in touch with nature – it’s all good for the soul, and good for your garden too. So that’s a good one to try the next time you have a sunny day. Meditate. Meditation has been proven to reduce stress levels. Do this on a regular basis, and it’s really going to help you increase your sense of wellbeing. Do some stretches. Stretching helps improve your body’s movement and reduce tension caused by stress and hours sitting at a desk. Drink a cup of tea. Find a herbal tea that you enjoy and take 20 minutes out of your day to drink it – without the distractions. Here’s a list of 7 teas – and their key benefits – to get you started. Do your skincare routine. Skincare doesn’t have to be about overpriced moisturisers that promise eternal youth. Just a gentle face scrub and cleanser can help refresh you when you’re feeling tired. Put on a face mask. Find a lovely, indulgent face mask, stick on some relaxing music, and do nothing more than sit quietly whilst that face mask works its magic. Paint your nails. A little bit of self care can be as simple as giving your hands a quick home manicure and polish. It’ll leave you feeling just that little bit more glam. Reorganise your wardrobe. Oh go on, you know it needs it. You’ll be surprised at the amazing outfits you find lurking at the bottom. Donate old clothes to charity. That dress you bought but never found the right occasion for? Release it from your possession, and feel good about it in the process by supporting your favorite local charity. Cook a healthy meal. If you’re tempted to end a long, tiring day ordering a takeaway, be kind to your body instead by rustling up a quick healthy meal – that time pottering in the kitchen will also help you wind down. Arrange a night out with old friends. Let you hair down, and catch up with friends you haven’t seen in a while at your favorite local bar. Listen to an inspiring podcast. There are some great podcasts out there to inspire you. I’d recommend Gretchen Rubin, author of the Happiness Project. Watch an inspiring ted talk. If podcasts aren’t your thing, get yourself over to Ted to check out their most inspiring talks. Volunteer at a local charity. The best self care is about helping others, and turning the focus away from yourself. Find a great local charity today and ask them how you can offer your support. Sit in the sunshine. Apologies to my fellow Brits, who endure so many months of rain on this green land of ours, but if you are blessed with a sunny climate, get some much needed vitamin D.
Drink a green juice. All those vitamins and antioxidants are bound to leave you feeling energised. Do some deep breathing exercises. Deep breathing is a well known technique for reducing stress as it slows down your heart rate – it’s great for when you’re feeling anxious. Have a lie in. Sure, you have a busy schedule that requires a 5am start, but make time in your calendar once in a while for a much needed lie in. Your tired body will thank you. Go through old photo albums. Visit your fondest memories from the past by trawling through some of your favorite photo albums – perhaps ones from childhood or that dream vacation you took. Of course, it’s all very well having a list of self-care ideas for you to try. But it means nothing unless you free up some time in your calendar. 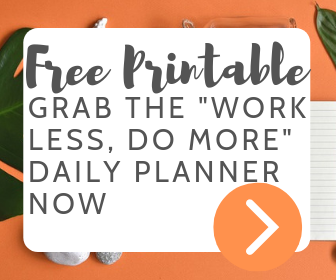 If you need some help with that, download my free printable (just below this post). You’ll get a few tips on planning your time so that you always get time for self care – no matter how busy you are.